Size: 5.0" x 2.6" x 1.0"
The original TI-1500 was soon replaced with this revised design. manufactured by Bowmar and known from the TI-2500B. Within few month Texas Instruments started production of their own LED-sticks and the TI-1500 was changed again. Don't miss the 3rd design. 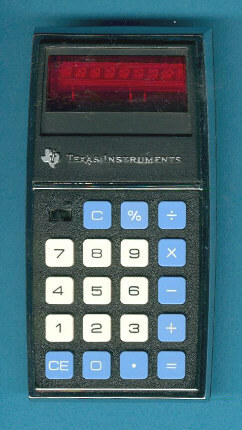 Texas Instruments manufactured the TI-1500 in Italy for the European market, too. © Joerg Woerner, November 15, 2002. No reprints without written permission.